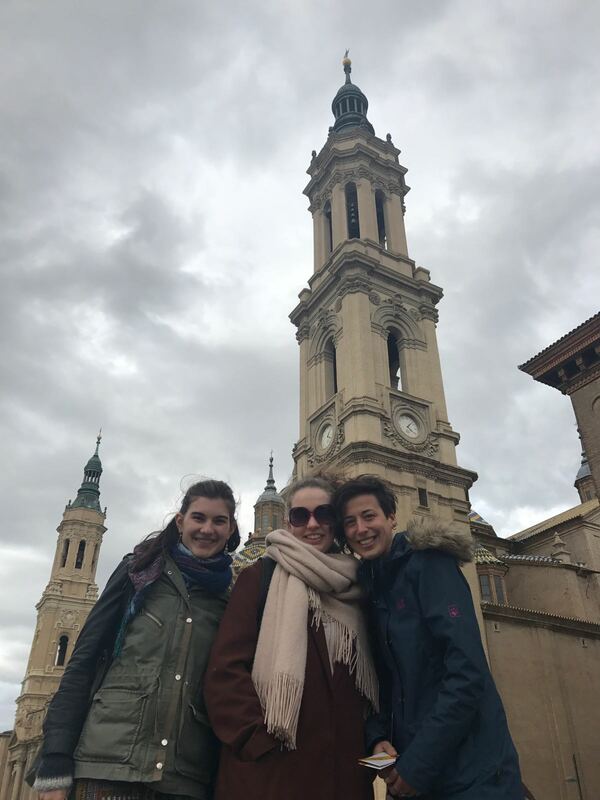 Since 2014 the small provisional communities have been an enriching experience, both for the communities that have welcomed them, the parishes, the places of solidarity and for the young people themselves who take part in this spiritual adventure. Life in the communities follows a rhythm based around praying together three times a day, taking part in pastoral and social activities with local Christian communities, visiting lonely people or those in difficult situations, and leading prayers and youth gatherings. We can not believe it, out last message, our last day. For Katharina and me at least, Zosia is leaving on monday and will still be here to see the great parade on Palmsunday (domingo de ramos). After having our midday prayers in schools, churches and parcs, we found a new amazing place to pray. On the rooftop of our appartment with an amazing view over the city. Other than praying we were mainly busy thanking everyone and saying goodbye. Wednesday was our last day at "las duchas" and the lovely woman that was always working with us brought us some very delicious home made Arabic snacks. Just one of the amazing people that inspired us this month. Of course we also brought some gifts for them and the wonderful people that came to our prayers donated some towels for the homeless. In the afternoon we had a Taizeprayer with the first year seminarians in San Miguel. 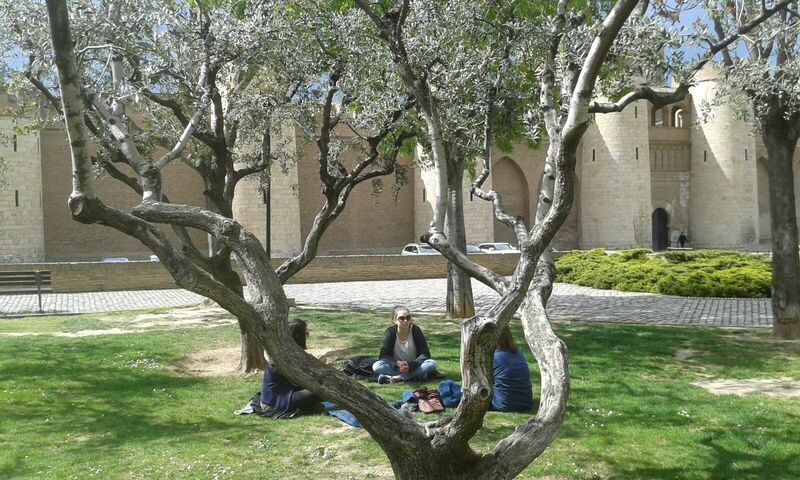 After we shared a bit about Taize and our experience in Zaragoza, we went out for lunch. 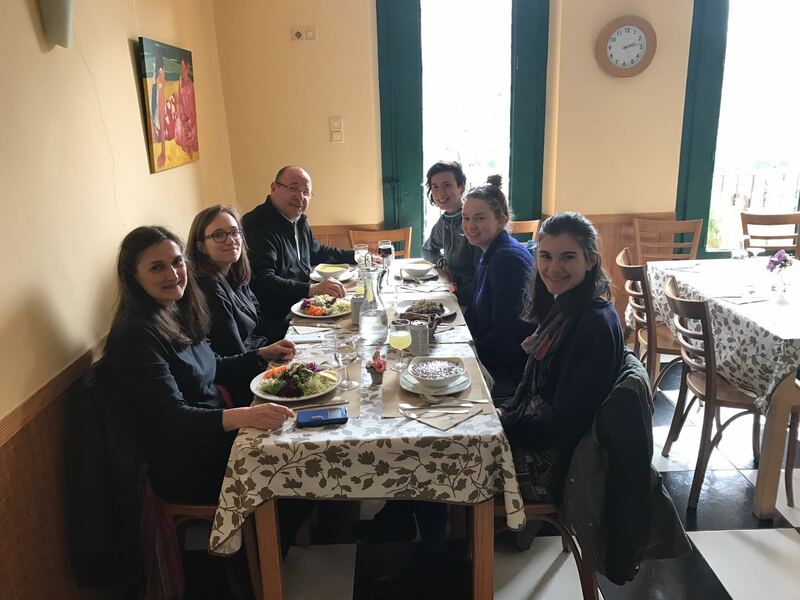 This lunch was for us also an oportunity to express our gratitude and give out some gifts to Juanse, the priest of San Miguel, and Daniel, the very young and lively seminarist in whose house we were living (and whose fish we lost). 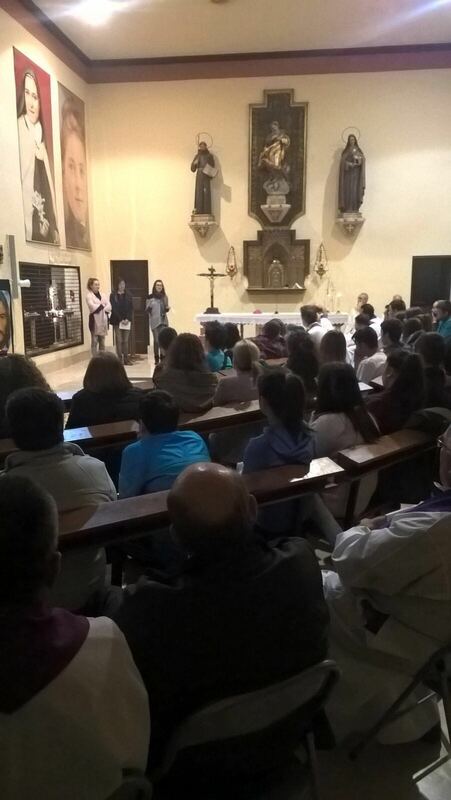 In the evening we had our last prayer in Santa Engracia and it was amazing to see that the amount of people in the prayer (also under the age of 50 ;)) was four times as much as in the beginning. We hope that this is only the beginning, because the prayers in Santa Engracia will continue, just like the prayers in Santa Isabel. After the prayer we had a small dinner with the people from that parish and shared with each other about the past month, our appreciation and our thankfulness. Thursday we had our last middayprayer in the school where Antiono works and after we had our last lunch together. It was again a good moment to reflect a bit on the experience and exchange thanks and gifts. 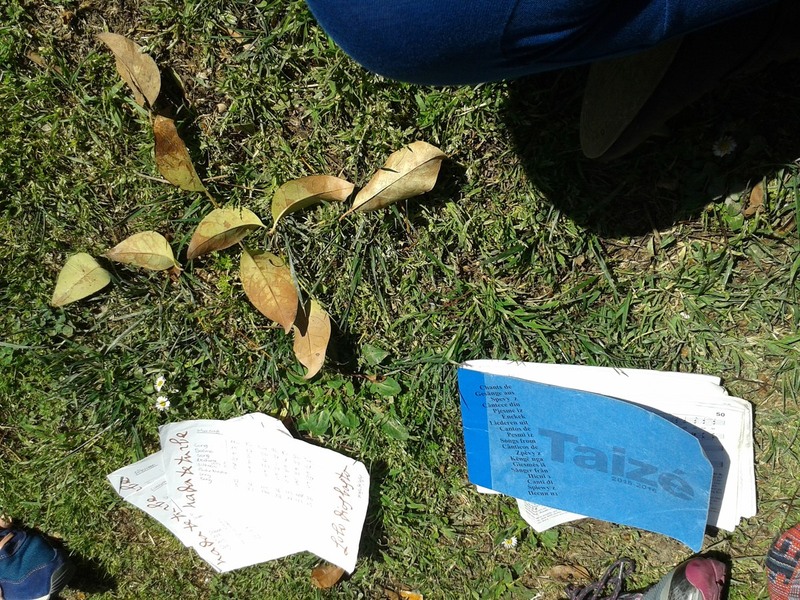 We barely have to translate anything anymore because Zosia seems te understand more and more. 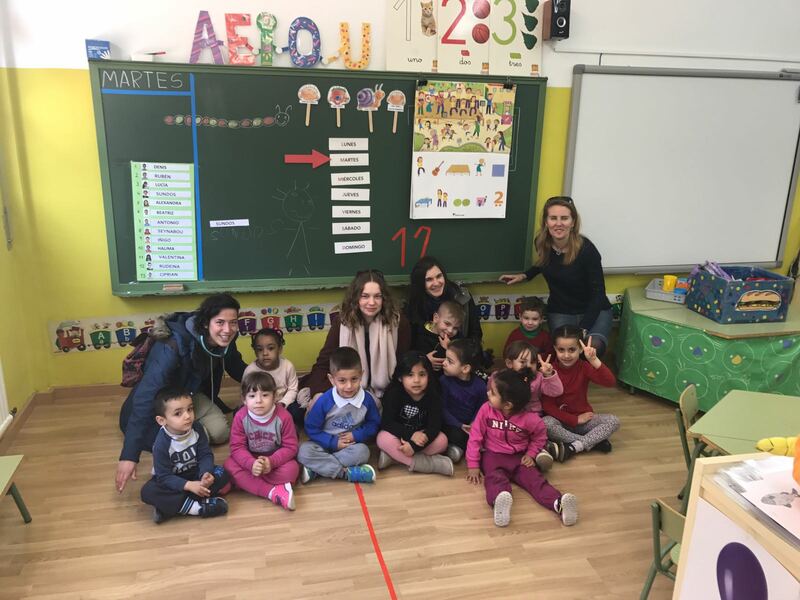 After lunch we spend our last afternoon with the kids in cuco, certainly one of our favourite places in Zaragoza. The centre is financed by the cityhall but they dont have a lot of money and a lot of the games are very old so we were very happy to be able to contribute some new games and toys. It was amazing to see how happy and grateful these kids were, jumping on top of us and when it was time to leave not wanting to let go of our legs. We will definately miss them! Tonight we will have our last prayer in Santa Isabel and our "last supper" with Pilar and her family. We are so thankful for everything we received and even more for what we were able to give. I guess this is one of the many things we learned through this amazing experience. That you can not give without receiving (at least not in Spain) and you cannot receive without giving. The small community might be finished but the seeds that were planted, only just started growing, in our lives and hopefully also in the lives of the people we were blessed to meet. The last week is passing. Next time on Wednesday we will be in different countries, experiencing different things. But we're not saying goodbye yet. We're still here together, living our community life, praying and working, slowly preparing ourselves for new adventures. 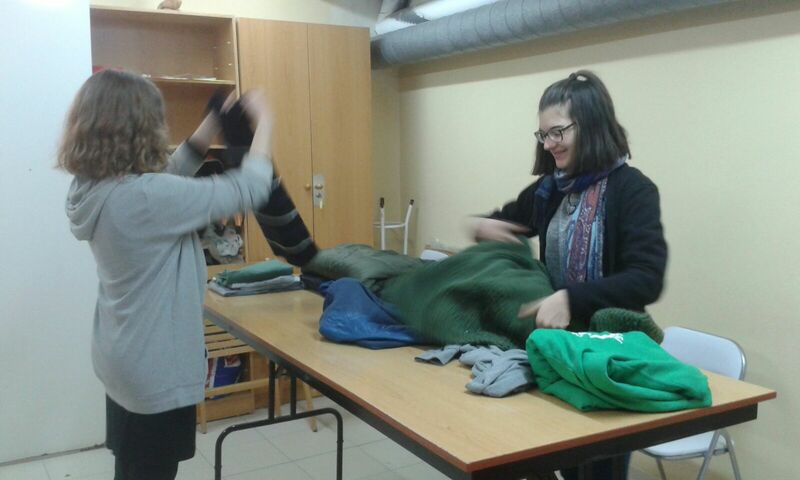 Last two days were pretty calm, our usual jobs (one of them you can see in the picture below) + on Monday evening Katharina and Nikki went to one community to share a little bit about Taize and our stay in Zaragoza. Because of my lack of Spanish speaking abilities (but funny fact – without studying at all I can already understand some parts of conversations), I spent a nice evening at home. I think we never told you about one very interesting story: in our flat we have a fish...well, actually, that's the point. One day during the dinner Nikki noticed that the aquarium is empty. We checked behind all decoration and Katharina even moved some stones but...there's NO FISH anymore. The owner of the flat doesn't know what happened either so if any of you know aything about the mistery of dissapering fish, let us know. 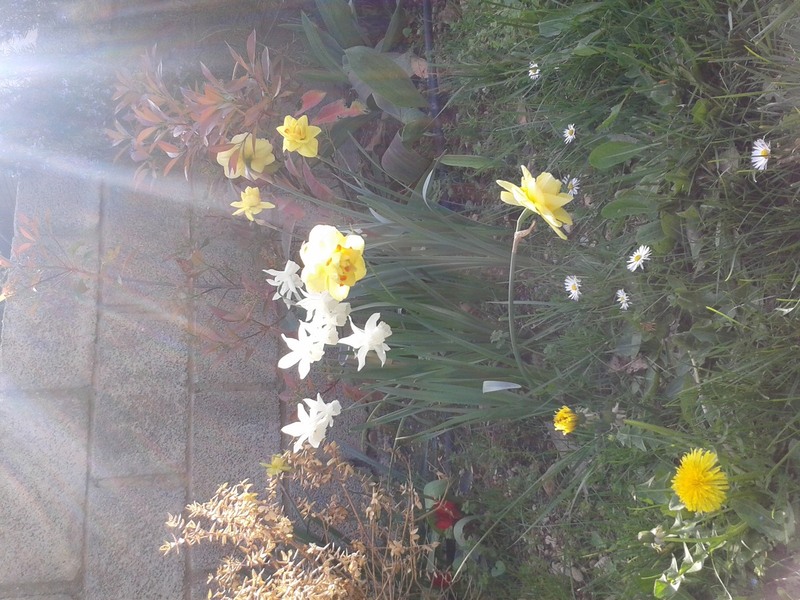 Our week was full of joy and ended with a beautiful weekend as even the sun smiled at us and created warm spring temperatures. On Thursday we already went to CODEF (education center for school drop outs) for the last time and shared our experiences with refugees in Taize and in Germany. 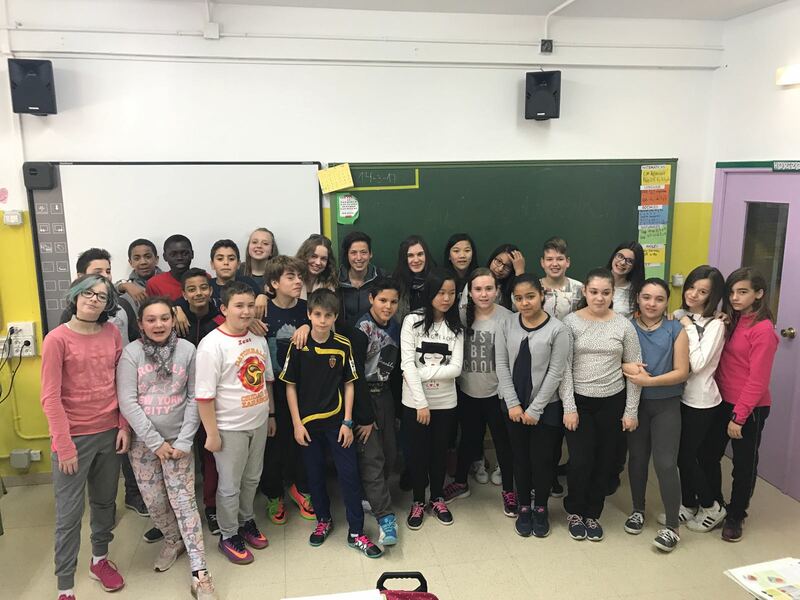 As there are few Syrians in Zaragoza, the teenagers seem to be very interested about the projects and we shared what we learned from the refugees about culture and communication. On the picture you can see the oldest teenagers that are studying at CODEF. As you might have already suggested by reading the headline, we had our first experience of „becoming famous“. Hahaha, no, just kidding. 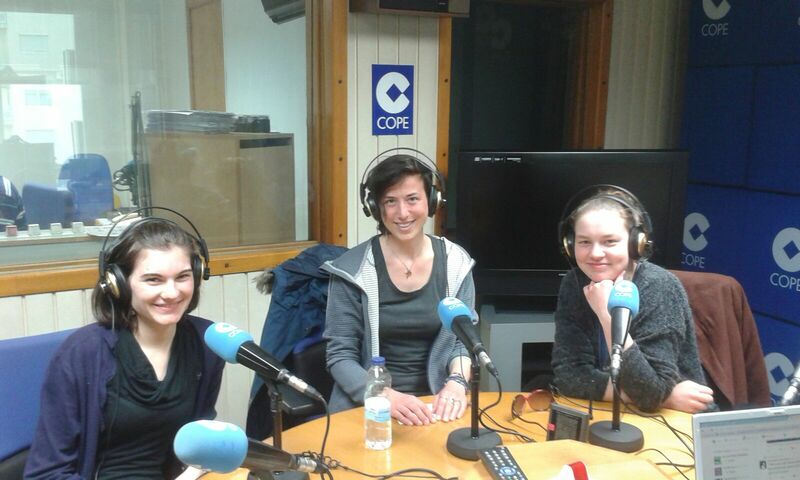 Thursday afternoon we were invited to COPE, the Spanish catholic radio to share our experiences as a temporal community of Taize. For me it was the first time to see how radio interviews are made. If you are interested, you can contact us and we send you the audio file (in spanish!). Friday was a special day for me. After prayer we went to „mochileros“, the place where homeless people can come to eat and to store their backpack. As there were a lot of volunteers in the kitchen I just went out to talk to some people. And I was so inspired when I got to know a homeless man from Algeria that had also lived in Berlin (my city). He was very interested in German politics and literature (a lot more than me ;) ) so that we had a long talk. He was such a special person. 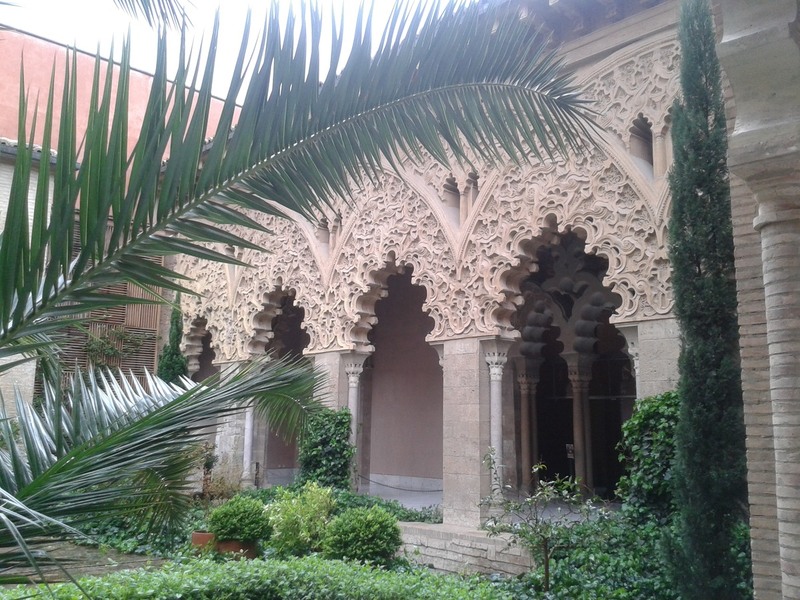 The Aljaferia shows the typical style of the architecture in Zaragoza which can be seen by the mixture of arabic/muslim an christian art, called „mudejar“. 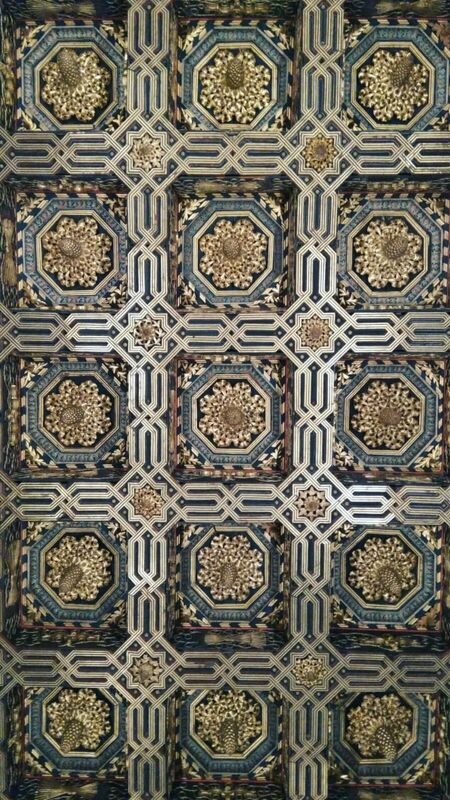 For me, this building, that has been built a long time ago, shows that it IS possible to live together in peace an even more: life is more beautiful if you share with people from other cultures and religions. 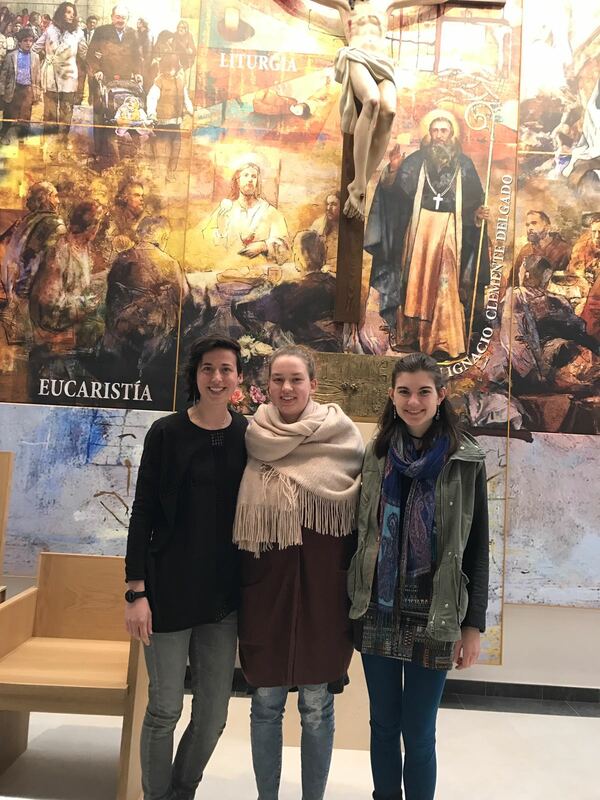 Saturday we participated at an adoration with Taizé songs and Sunday we went to mass at the curch „El Portillo“ to talk about Taizé and give testimony of the way each of us lives our faith. Times flies when youre having fun and thats definately what is happening to us, we cant believe we're already over half of our stay here. Yet so much has happened, where do I even begin. This weekend we had some very interesting activities. Friday we went to Monzon, a village two hours from Zaragoza. Every month they organize a prayer for the young people from the surrounding villages. The bishop that is usually present in these prayer and loves Taize invited us to give our testimony and sing a Taize song. 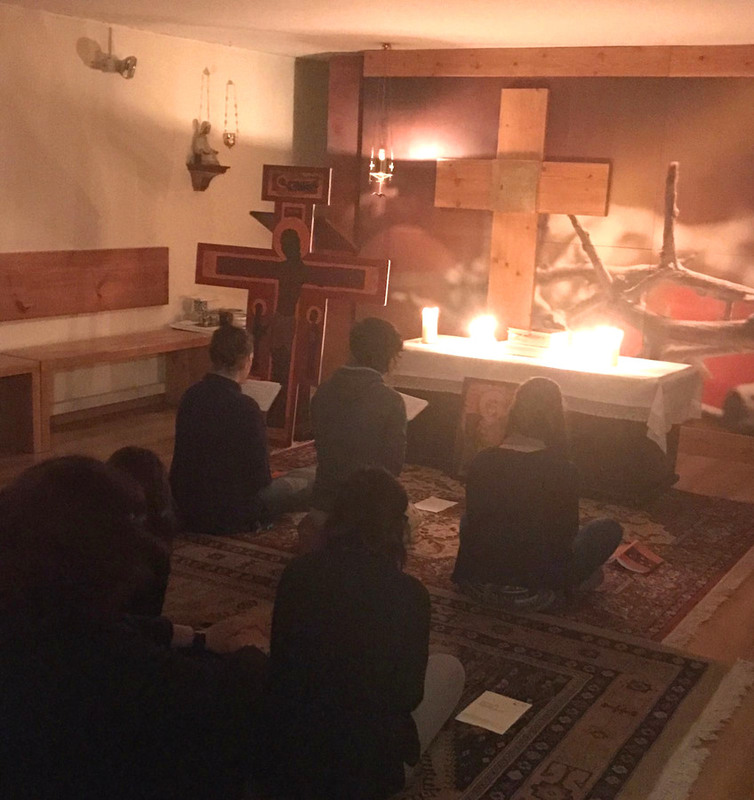 We were already getting used to sharing about Taize but this was the first time we shared for a big group of people on a more personal level and it was a good opportunity for us to reflect a bit about our stay here. The prayer was also very beautiful, it was mainly about confession and reconciliation. The young people were invited to paint with their hands red stripes on the face of Jesus as a symbol of their sins, after confession the bishop cleaned their hands with water. The prayer took place in a clause monastery where sisters live seperated from the world. I had never seen anything like this and in the beginning it felt a bit like a prison but talking to the sisters I discovered that they are actually experiencing a really big freedom that certainly made an impression on me. After the prayer we had dinner with the bishop and late in the evening in the pouring rain (and later even snow) we were brought back to Zaragoza. The next morning we were picked up again to go to Caspe, another village close to Zaragoza. Once a year they organize a meeting for young people from surrounding villages. The theme was: Sal de tu tierra! Which in English you can translate to ‚the salt of the earth‘ or ‚leave your country‘. We thought it was the first one but it turned out to be the second one. Leave your country based on the text from Genesis 12.1-4, or how they translated it for the young people, leave your comfort zone. There were four workshops organized by people that left their comfort zone to follow God and we were very excited to be one of these workshops. 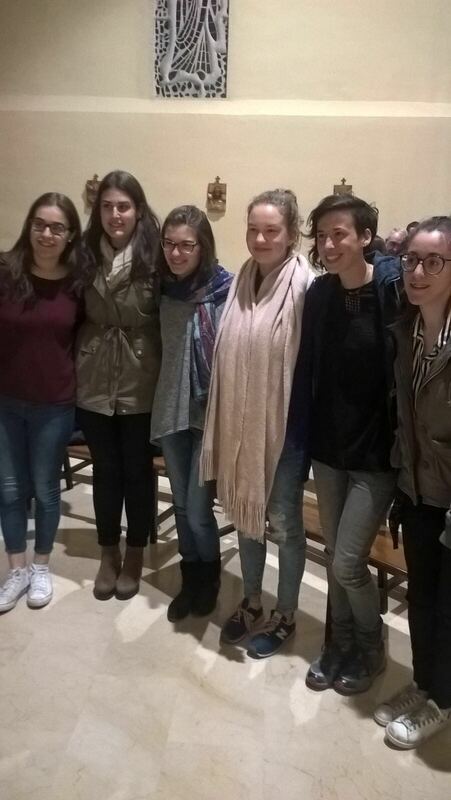 Katharina spoke about her experience in Taize, Zosia about her experience in Poverello and I spoke about my experience walking the camino de Santiago. We all spoke about our reasons for leaving our comfort zone and what it brought us. We showed some pictures and had to repeat this workshop four times. It was really a gift to be there and share with these young people our experience, of course all of it in Spanish. After the workshops there was a prayer and after the prayer there was more Spanish food! 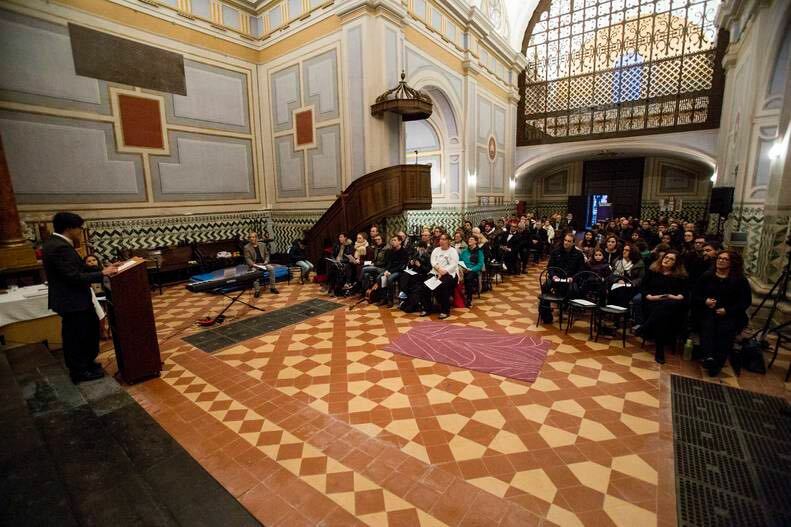 Arriving in Zaragoza we immediately went to our next activity, a Taize prayer organized once a year by migrants. They were so happy that we could be there even though we didnt even really do aything special. After the prayer we immediately went to the next place for the inauguration of the Anglican church, with the very young priest (one year younger than me) from Nicaragua that we already spoke and ate with a couple of times. It was a very lively celebration with dances, performances, an amazing gospelchoir, peoples from all different confessions and of course we also sang some Taize songs. After a long day and a short night of sleep (of course the timechange had to be this weekend) we went to the sundaymass for children in the parish where we have most of our Taize prayers. We spoke to the kids about Taize and after the mass we thaught some songs to the choir. In the afternoon we had a wonderful lunch at Pilars place with her family and priest Carlos. We managed to stretch this lunch until nine o clock in the evening, talking about everything and nothing in three languages at the same time. Tired but very fulfilled we finished this amazing weekend. And Monday the work was calling again, but before we had lunch with Antonio and told him about our experiences of the weekend. He invited a Jewish guy from Argentina with who we shared some very interesting thoughts about faith and life. The first week passed. Well, actually more than a week. Already! It seems that our job schedule is pretty fixed. Finally, we work in five places: the already mentioned Cuco center, the place where homeless people can take a shower and wash their clothes, CODEF, and the fourth one is Mochileros where the homeless can leave their cloths and eat something little. In the last one we're starting today in the afternoon so our impressions next time but it seems very interesting as Nikki's and my job is supposed to be talking to people and Katharina will help in the kitchen. Exciting. 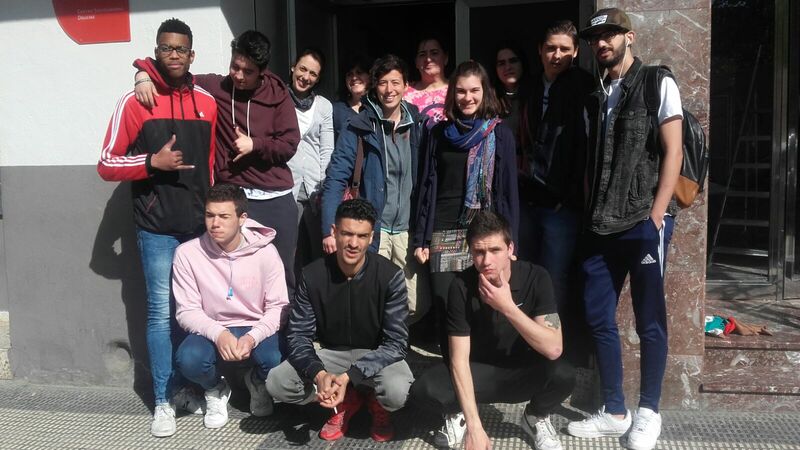 On Monday we had a pleasure to help with English classes in the school where Antonio works. We felt very priviliged and important as kids made an interview with us. It was a perfect occasion for them to practise their English and for us to share a little bit about the culture of our countries. We spend our days on praying, working and meeting people. For me more enjoyable are the first two activities as the third one requires the knowledge of Spanish that I don't have. But we all treat it as an extra challenge and it's a great opportunity to start my adventure with this language. A very interesting experience is looking for spaces for our Midday Prayers. As we can't establish them for a certain hour and place, we improvise. And once we just went to the school (where we've already been but still) and asked if we can pray in some classroom. Yes, improvising. We're continually grateful for all blessings we receive and we're looking forward to the next days and what they will bring. Today we went to work at the CODEF, which is a place where school dropouts go for classes and to learn a profession. CODEF doesnt look like the common school, it has classrooms with graffiti decorations and a lot of workrooms for workshops. All the students are very creative and their art is visible throughtout the centre. We were asked to speak a bit about our experience with refugees in our country and about our experience in Taize and their vision on refugees. We used the little booklets of the proposals and what is written there towards „unity in the continent Europe“. We read the text together and dicussed about some questions. 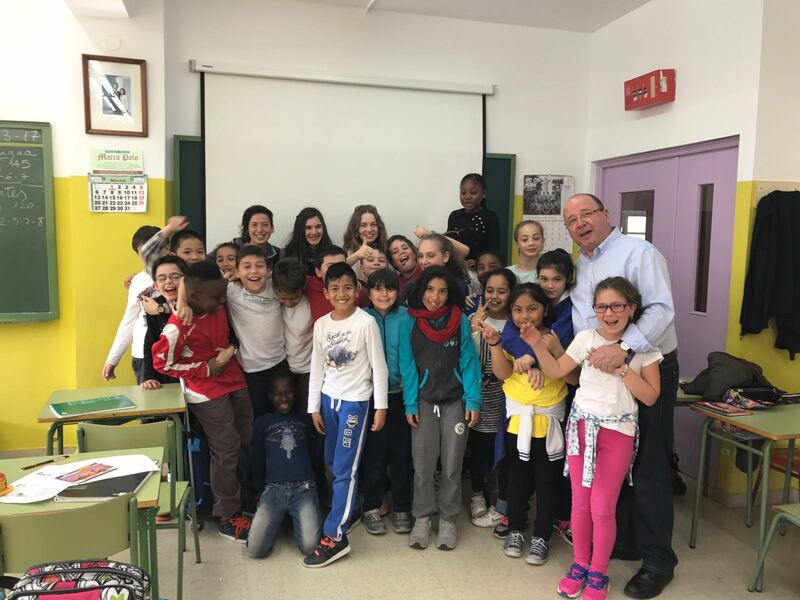 The students seemed to be very interested in the subject and shared the opinion that if we would know more about other cultures it would be easier to understand them and respect them. A lot of wisdom in those words, many politics could learn something from this point of view. I told a bit about my experience with refugees in Germany and showed some pictures and even a movie of the sugarfeast. It was a beautiful experience to see the interest and the open mind of these young people. Somehow we managed to fill an hour and a half without someone losing their attention. We are asked to come back next week, So more info will follow. Gracias or Muchas gracias doesnt even begin to cover how thankful we are for everything we have already received. And to think we have only just arrived. We are very privileged to be welcomed by the wonderful Pilar, her beautiful daughter Clara and the very lively priests Carlos and Antonio. 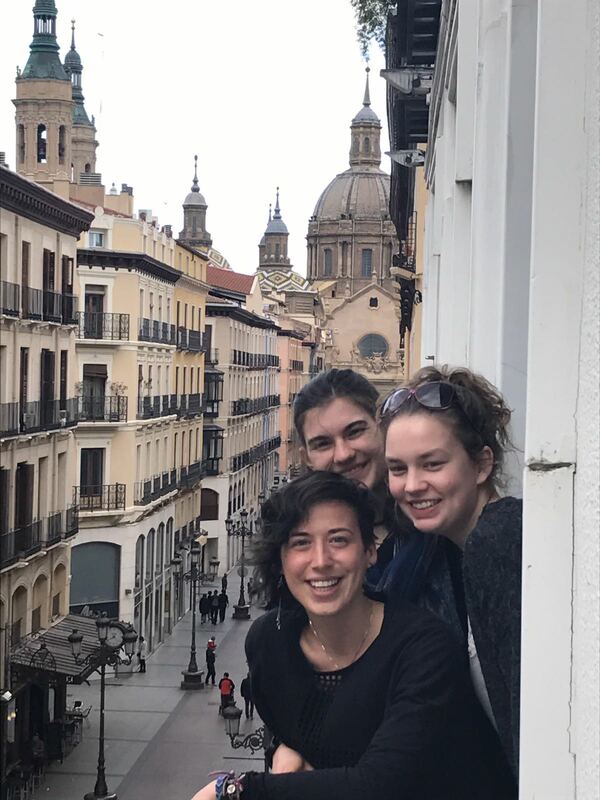 It was really a warm welcome, not only because of the amazing Spanish hospitality or the very tasty tortilla de patata that Pilar prepared but also because it was 30 degrees outside. 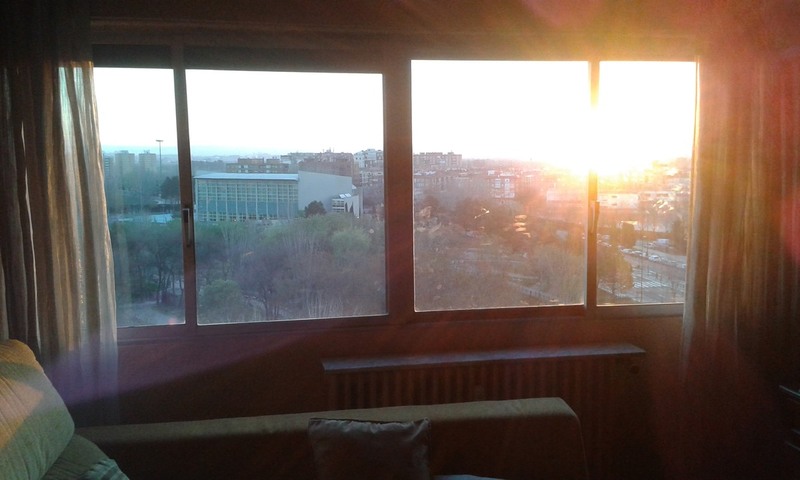 They arranged for us a wonderful appartment where we can see the sunrise over the city as we wake up early to go to our morning prayer, which is at 8 o clock in the parish of San Miguel. 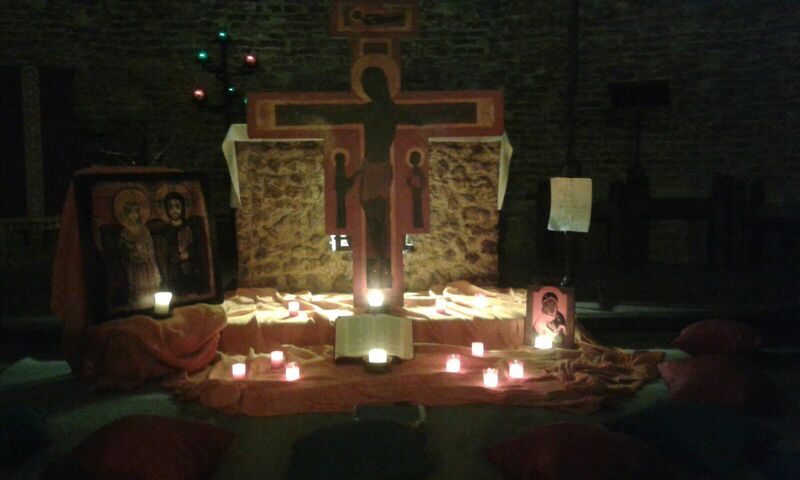 There we have a beautiful chapel with a taize cross, the icon of friendship and many candles (see pictures), we felt instantly at home. After a short night of sleep Antonio took us to discover a bit the city and get to know some amazing people. The day started at 8 o clock praying the Laudes at his parrish, it followed by having breakfast with some great people of the parrish, attending the mass, meeting a lot of people, lunch at his moms place, some sightseeing, taking a million pictures (see pictures), meeting more people, a mass at the seminar where we met even more people (mainly priests and seminarians and even a bishop) and finally dinner in the best chocolate cafetaria in Spain with afcourse some more people. Antonio seems to know everybody and now we do as well. The mass in the morning was mainly for families, there were a lot of kids and we were all very impressed by the way Antonio talked to the children about God. I think my favourite moment was when the children were running around the church to wish aka high 5 eachother the peace of Christ. 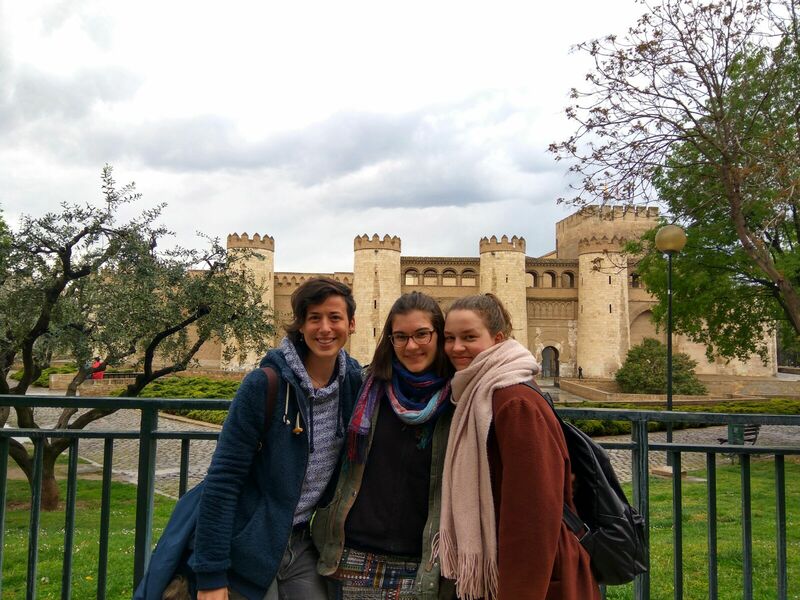 All happens in the Spanish way and in the Spanish language so we are very lucky that Katharina and I understand more or less what is happening and can translate for Zosia. Our program for the month is still changing every day but Pilar is in contact with a lot of different organisations and has arranged for us two jobs we are very excited about. For the moment were working two mornings in a place where homeless people can take showers and wash their clothes. 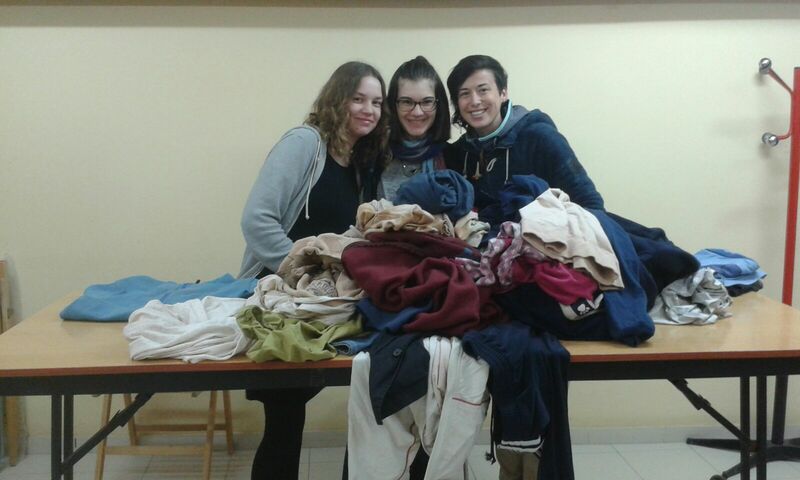 We help mainly with folding and hanging the clothes. 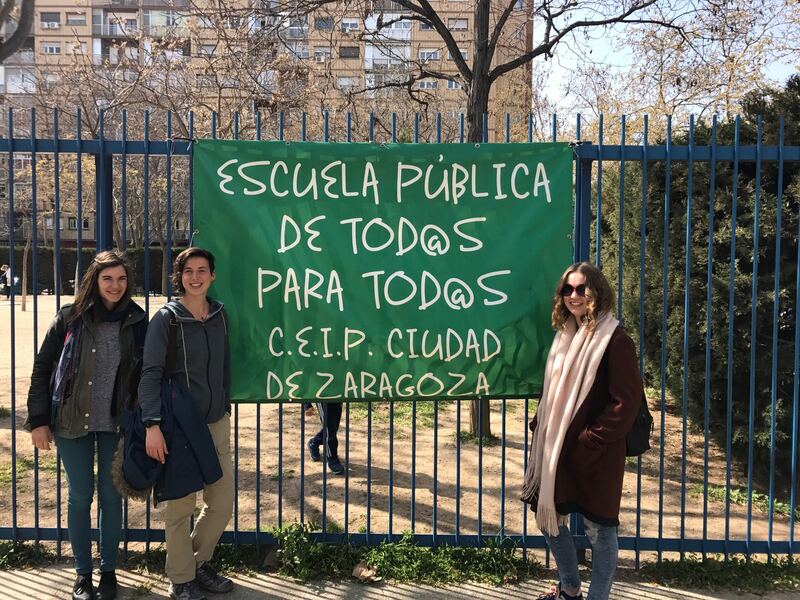 Today was our first day and we were very inspired to see and hear that Zaragoza has such a good social network to take care of the poor and the homeless. Many of the immigrants that come here have been in many different countries and say that its nowhere as well organised as here. 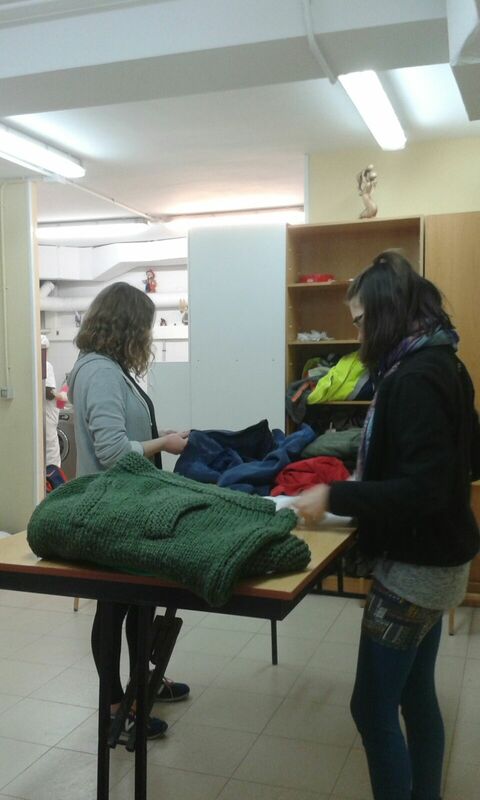 25 volunteers work in this place and some sisters of the daughters of charity, which we also have in Taize. Everywhere we go to invite people for the prayers and they even made some very proffesional looking posters to make some publicity. Even without this publicity there is already 4 people in the morning and 8 in the evening (or what they call here afternoon). The midday prayers we do with the 3 of us, depending on where we are at that moment. Yesterday we did the prayer in a classroom in the school where Antonio works. Before the prayer he took us to every classroom to introduce us to the kids and afcourse to make some more pictures. Its really a wonderful school, very lively and colourful and with kids from all kinds of backgrounds. Everybody is welcome here. Probably we will come back to do some English conversations with the older kids. In the afternoon we will work in a youthcenter. Yesterday we were there for the first time and its really a very warm and welcoming place with a lot of diversity. The kids are very energetic and are all over us. Katharina and Zosia work with kids in the age of 11 to 14 and I work with the little ones, from 6 to 8. This work is for Zosia also an amazing way to learn some Spanish and for the kids to learn some English. So far it feels like we are in a rollercoaster and we are just very much enjoying the ride. 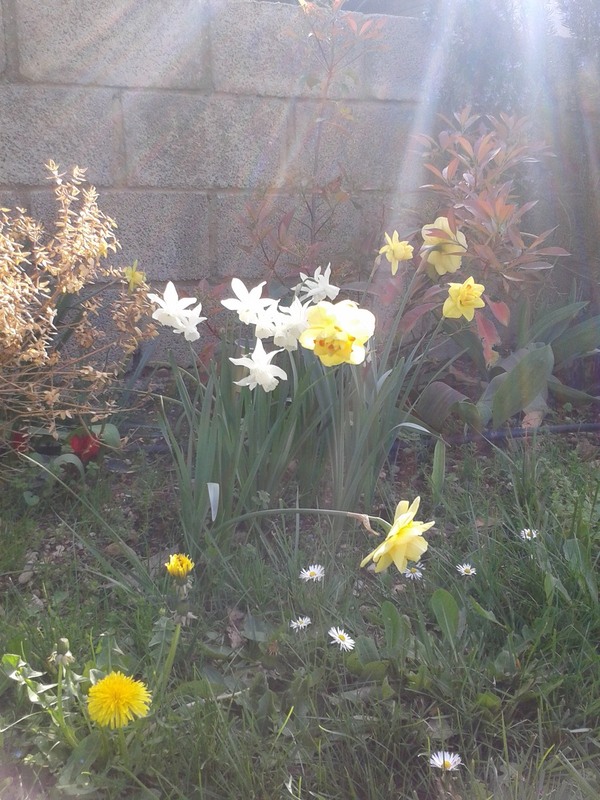 Our prayers are filled with thankfullness but also with the wonderful people that welcome us and the kids and the homeless we meet during our volunteering work. 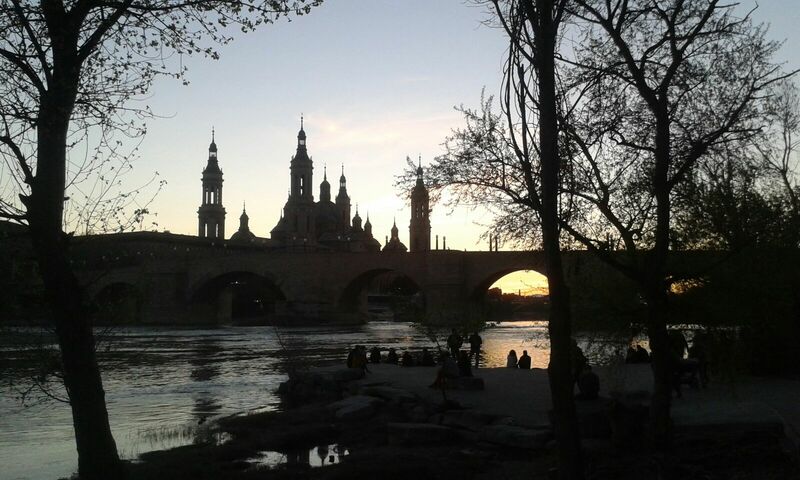 Zaragoza (in English also written: Saragossa) is the capital of the autonomous community of Aragon, in Northern Spain. 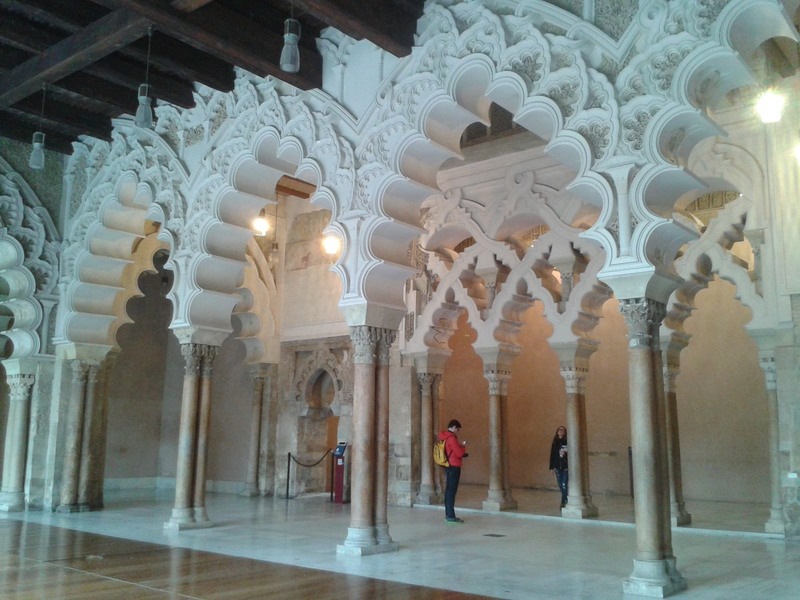 It is surrounded by the Ebro river which you can also see on the picture below. About 700,000 people live in Zaragoza. 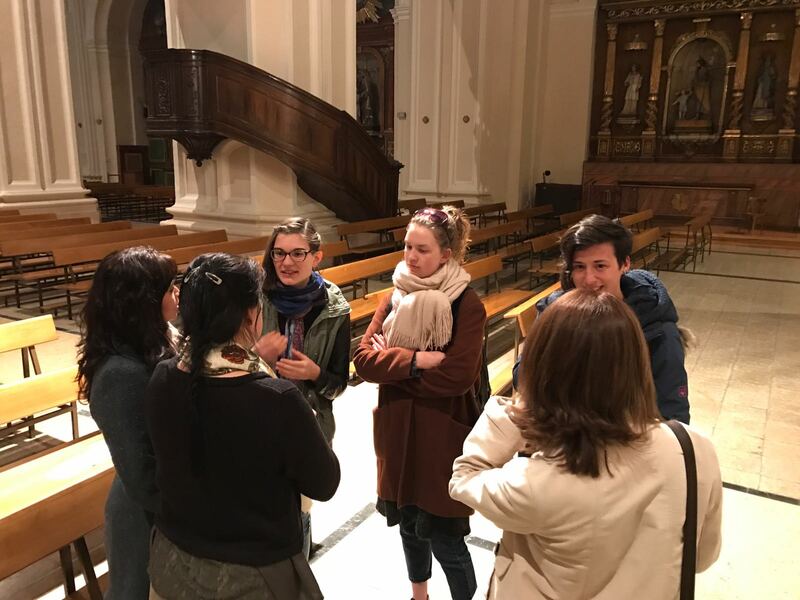 We received the first message from Brother Leo in Taize and thus got to know each other.